BRACKNELL, UK. 12th March 2019 – Panasonic, Europe’s leading rugged computing device provider, today announced the next generation of Panasonic COMPASS, its market-leading suite of enterprise management tools for Panasonic TOUGHBOOK rugged tablets and handheld devices running the Android operating system. The latest additions to the Complete Android Services and Security package include a new proprietary rapid configuration tool, enhanced security updates for up to 10 years after device deployment, as well as a Mobile Enterprise Application Platform and an application submission portal to certify new applications for Panasonic Android devices. To enhance the user’s experience straight out of the box and to provide devices with a company identity, COMPASS Custom offers multiple levels of Android Operating System (OS) customisation. These options range from changes to the basic look and feel of the OS, to a custom kernal with specific drivers, through to full access to the build environment. 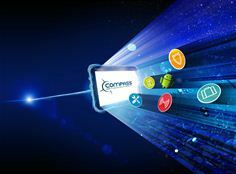 COMPASS Security is the complete lifecycle assurance and management solution for TOUGHBOOK Android devices, ensuring the mobile estate is fully protected and device performance optimised. COMPASS Security gives IT administrators the choice of how to deploy updates – locally or remotely via MDM, FOTA or Advanced FOTA – and continues well after product End of Life. The standard service provides on average 2 updates per year, continuing for 1 year after product End of Life. The premium service provides support for up to 3 years after product end of life and can be extended for up to 5 years, with more frequent patches, including support through OS transition, where applicable.